No, the TARDIS isn’t going into mass production just yet. I’m talking about the other time machine. Soon we’ll all be driving around at 88 MPH pretending we’re the Doc! Gizmodo is reporting that the DeLorean Motor Company in Houston, Texas is going to start rolling new DeLoreans off the production line in 2008. The company currently charges $42,500 (around £21,000) for what they call a “remanufactured” DeLorean, so I expect they’re going to be charging quite a bit more for a completely new one – especially since they’ll only be producing around 20 each year. I just hope they’ll make a Back To The Future special edition with a flux capacitor, Mr Fusion and flying capabilities that’s within my price range! Looking at reviews of the original cars they are less than glowing, but isn't it amazing that bad reviews don't diminish my desire for the car. Christian, you're absolutely right. I've read all about how crap they are before but I don't care; I still want one! 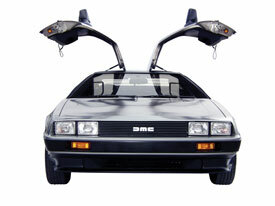 I should've bought this one three years ago (complete with all the BTTF replica bits) when I had the chance!